We began the Season of Advent on Sunday! The church is decorated with the Christmas tree, Advent wreath, poinsettias, and the beautiful Nativity seen on the communion table. Shellee Riggio shared personal words about “hope” (our theme for the day) and then danced a stunning American Sign Language interpretation to the song “I Hope You Dance.” Kathleen Dahill sung a perfect solo for the day and taught the congregation a new song about waiting for the Lord (another Advent theme). 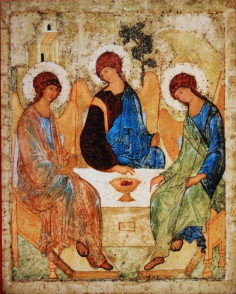 I also shared a famous Russian painting by the 15th century artist Andrei Rublev called “The Holy Trinity.” (There is a picture of it below.) It is a very different image of the Trinity than the pictures I saw growing up, in college where I studied philosophy and religion, and in seminary. In most of those pictures, the figures are typically very masculine: an old man with a long white beard, a younger man with a long brown or blonde beard, and a dove or other figure or symbol for the Holy Spirit. The images in those pictures also indicate an authoritarian God, and frankly, a Caucasian God. In Rublev’s iconic painting, however, we see three figures sitting around a table enjoying a meal from a common vessel. Their heads are bowed in humility to one another and they sit as equals. On the front of the table, in the center just below the bowl, there is a rectangle with remnants of glue. Some art historians believe there was once a mirror attached there. Whenever someone saw the painting, they saw themselves as part of this humble and intimate communion of God! During the Season of Advent, may we remind ourselves that God is relational, intimate and inviting. What more hope for the world do we need than that?